It was already too hot to look for flowers this morning, so red, white and blue pots it is! The red yucca is flowering in blue? Hey! Hesperasloe parviflora flowers don't look like that! Seems like my Morning glory (Ipomoea tricolor) seeds from last year found their own trellis. I suppose I could weed them out, but they add some interesting color, and don't seem to harm the red yucca much. It picked an excellent place to grow - well protected from predators and gardeners alike! My favorite plant this week started out as a self-sown "weed"
I was very excited that a california poppy had decided to self-seed in my garden. They are very common here (the CA poppy reserve is fairly close) but none had ever decided to grace my garden before. um - poppies around here are yellow or orange. not both. A bit of research reveals this is likely Eschscholzia californica ssp. maritima - the coastal form of California poppies. It has bluer, more compact foliage that the species, and a distinct yellow flower with orange center. As best I can tell, my "weed" matches all those characteristics. I'm not sure how a coastal poppy ended up in my desert garden, when there are so many more "normal" orange poppies around. But I'm happy it did! I'm planning to plant some of the standard species next fall, but i hope this one comes back too! I'm joining Loree at Danger Garden for her favorite plant meme - although I'm sure I won't be posting weekly! Her favorite plant is always worth a look, and the comments at her blog have more awesome plants to look at here. The front garden has been taken over by bloom spikes. Above is red yucca and Calandrinia grandiflora. The Caladrinia is not supposed to be hardy here, but try telling it that. It's busy trying to take over the entire flower bed. These plants will bloom all the way to fall. 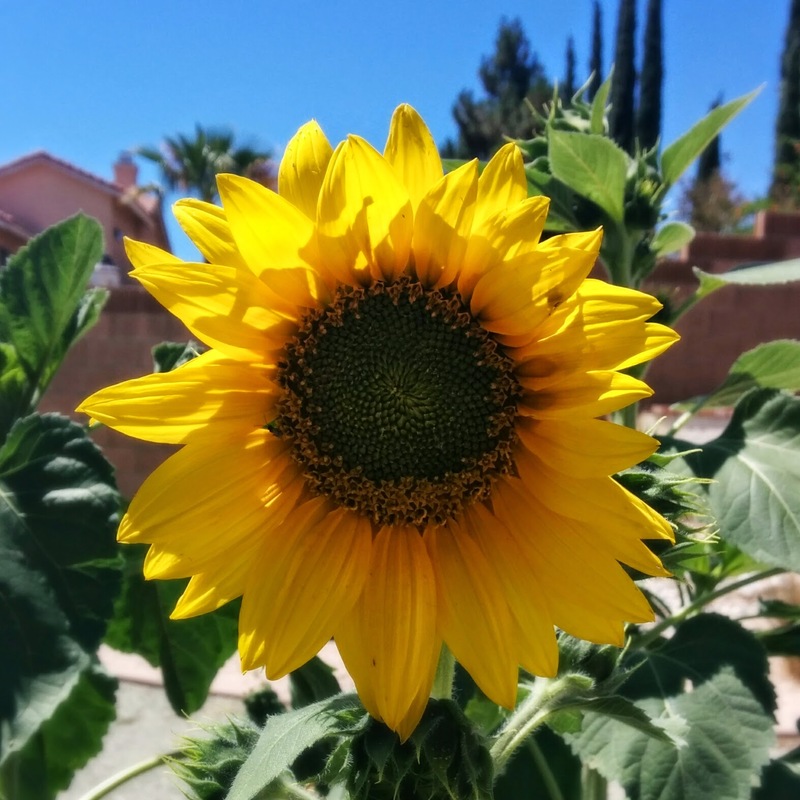 They nearly died back in the winter, but started growing and blooming in early fall. The flowers only last a day each, so they don't make very good cut flowers, but they are pretty in the garden. I might want to think about whether there is such as thing as too many spikes though! The A. 'Mediopicta Alba' is on the north side of the house, which gets a lot less sun that the back garden, and basically no extra irrigation. It will be interesting to see how fast these pups grow. The parent plant hasn't gotten much bigger in the 2 years that it's been in the ground. The third didn't get covered, and looked like it was dead.. but wait! 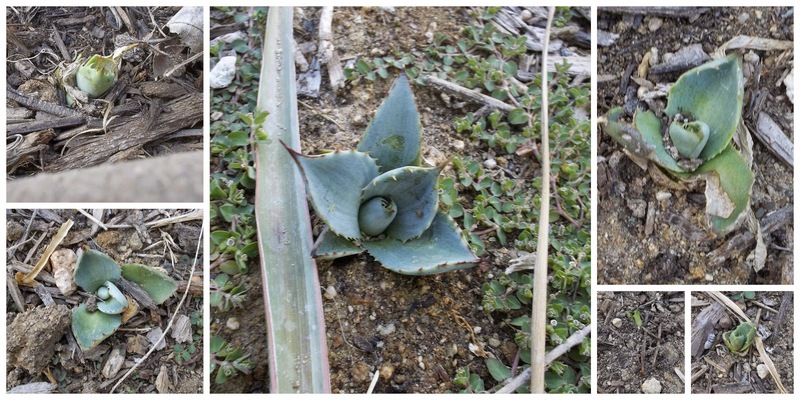 I don't think I've seen an Agave do this before? 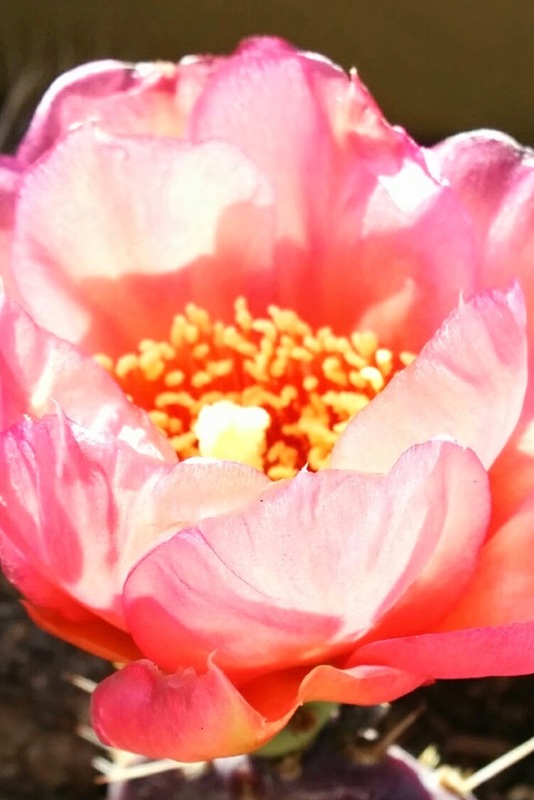 This is perhaps a bit of "cheater" bloom day post - instead of showing you all the blooms in my garden, I'm focusing on just one. My Yucca pallida is blooming! I planted this plant when the back garden was just redone, so about three years ago. This is the first time that it's boomed. The bloom stalk is bigger than the plant! The foliage is really pretty too! This yucca stays pretty small (20 inches in diameter) which I should have realized when I planted it! I think I'll move it next fall or spring to be closer to the front of the bed that it's in. It's hardy in zones 6a to 10, and seems to have very little problem with our heat. If you visit Carol at May Dreams Gardens you can see everyone else's bloom day posts, with way more flowers than mine! I have many (9, I think) of the red/pink version, but only 1 of the yellow form. I wanted more for the back garden when I replanted it, but at the time, you couldn't find them anywhere! Even now, the red is way more common, but I did notice that the nursery that did my landscape installation now seems to have several. I finally found mine about a year ago at the Huntington Garden plant sale. 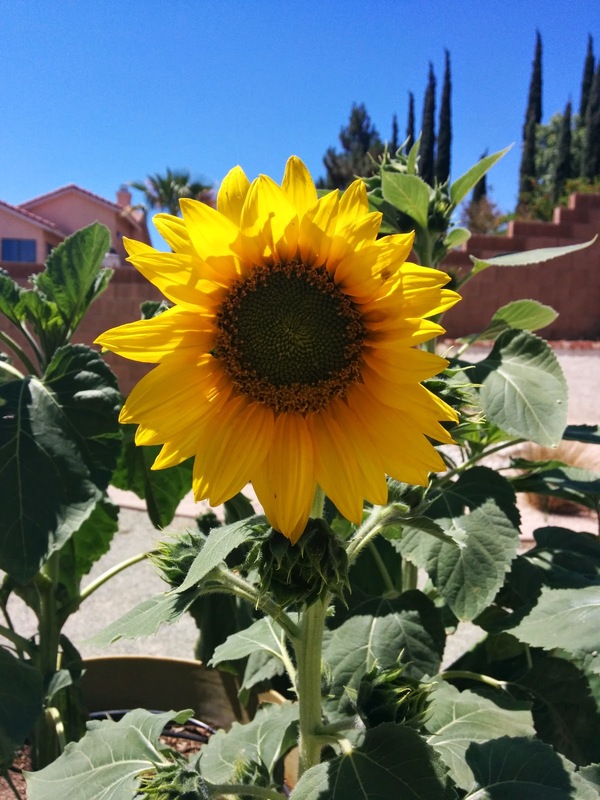 This is the first year it has bloomed in the garden. H. parviflora is also known as Red Yucca, or False Red Yucca. The clumps get about 3-4 feet tall and wide, and they grow well in the heat. They don't need a lot of water, and don't need a lot of care in general - other than trimming the dead flower stalks off. If the clumps get really big, they should be divided, although I haven't done that to any of mine yet. The leaves don't have teeth, but the ends are sharp! Wider view. This clump has been in the front garden for about a year. tiny new growth on Lantana NOID. Hopefully it will catch up! 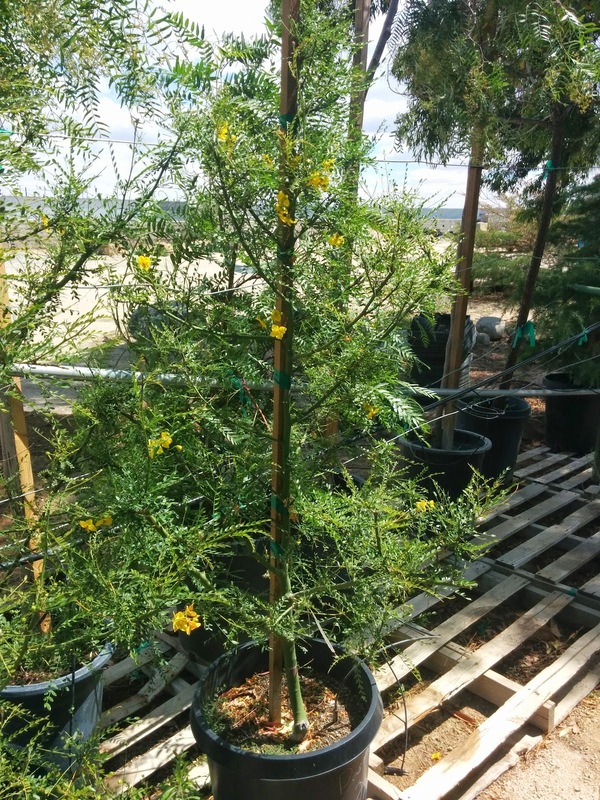 We're at the edge of the winter hardiness range for Palo Verde - so it was important to get this one planted early to give it the most time to establish before winter. There are several mature trees in my neighborhood, so if it survives the first winter, it should be good. 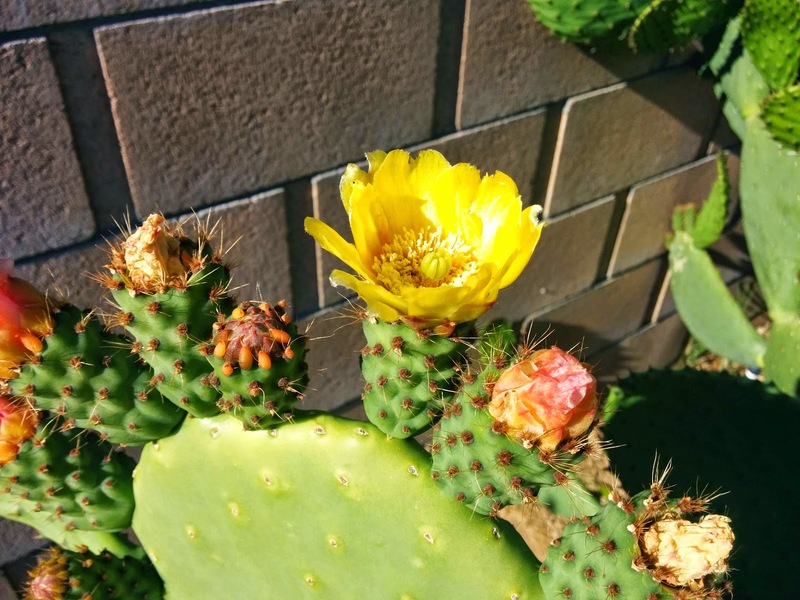 Plants planted include a lot of Opuntia - including o. basilaris, o. macrocentra and an Opuntia NOID. While all of them have rooted, they do seem to need time - in some cases a year - before they start growing new pads. The Centaurea gymnocarpa survived the winter and is going gangbusters. I'm on try 2 to get the same plant to grow on the other side of the hill. Any and all attempts to get any groundcover to grow next to the steps has failed. Hopefully, by the end of the summer, there will be more progress! Because how can it not be? These particular ones self-seeded themselves in one of the tubes. I planted some named varieties a few years ago, but I've long since forgotten which ones they're supposed to be. This year, there are six plants growing. This one is the first to bloom, at about 2 feet tall. According to Sunset, these annuals need a lot of water. 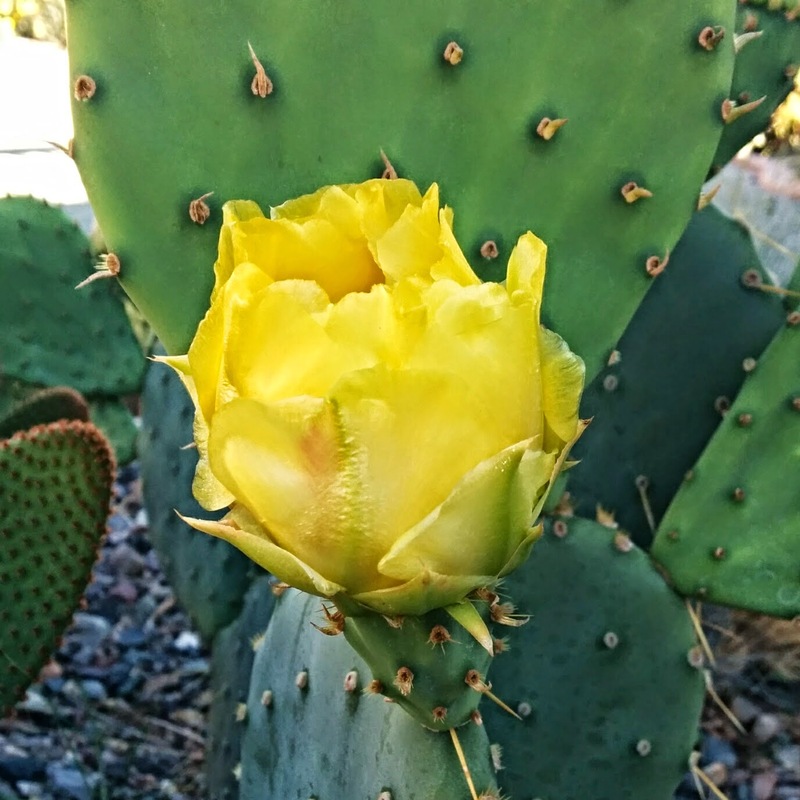 In my garden, they've seeded themselves in the tube with the Opuntia pads, so they're not getting that much water. They're also not staked (lazy gardener!) but seem to hold up alright in our crazy winds. In the fall, the birds like to hang from them to eat the seeds. All the pups - the biggest is maybe 1.5 inches tall. I was looking near the mother plant - the closest of these pups is almost 1.5 feet away. I'm still excited about having a colony of these - but maybe it will be slightly larger than expected. At least it's happy! It's been a busy few weeks. I finally gave in to the nice weather and started planting last weekend. While out weeding and planting, I was buzzed several times by the resident hummingbirds, wanting their picture taken, I think. caught at just the right moment! I think this might be an Anna's hummingbird although I'm certainly not good enough to be sure! I'm still waiting for my Y. rostrata to grow a trunk or something, mostly so I can cut some of the old leaves off. It's only 2 years old though, so I might have to wait a while. And the Y. louisianensis doesn't really look like all the descriptions online (it has wide leaves?) I may have to wait for it to bloom to have a better guess at an ID, if the tag isn't right. It's very pretty though, and has grown a lot in the two years its been planted in the back garden. Since this one is all the way leafed out, and there is no sign of the other one, I'm going to guess that it's done for... Do rhubarbs die when they bloom? They don't really like the desert much, but this is year three for this one, so I can eat some now! I'm going to have to dig that one out of its tube and liberate some of the pups soon... before they grow through the tube! unknown Optunia - if these are flowers, that would be the first year it flowers! Thanks for visiting my garden... I'm off to look at other bloggers' contributions to Foliage Follow-Up!